When the Android N developer previews were released, we learned about a hidden "Freeform mode" that takes multi-window to a whole new level. Instead of being limited to two apps on top of each other or side by side, Freeform would let you open as many apps as you want and resize them any way to fit on the screen. But we later learned that Freeform wasn't going to be enabled on any existing Nexus devices, not even the Pixel C which would benefit a lot from it. Instead, the Freeform APIs were being made available for OEMs in case they want to implement them on their own phones. But those of you with a little bit of patience and some basic know-how (or at least the ability to follow instructions properly), were able to activate Freeform on their own Android N phones and tablets with some adb commands. If, like me, you've hung your modding/tinkering cap a while ago, you'll be happy to know that there's now a third-party app that does the trick, no adb or root needed. Enable Developer Options on your phone by going to Settings -> About phone -> Build number and tap that several times until you see that you're now a developer. Now go back to Settings -> Developer options and find Force activities to be resizable (it shows at the bottom of the list for me). Enable it. Install Taskbar from the Play Store (you'll find the link in the widget below). Enable Freeform window support in the app. Then turn Taskbar on with the toggle at the top of the app. You'll now see a floating app drawer icon in the bottom left of your screen. Clear all your recent apps, because they need to be freshly launched to open in Freeform mode. Go back to your homescreen and tap the Taskbar app drawer icon. You'll see the pop-up with the app list. Close it and reopen it a couple of times, until you notice the launcher disappear in the background and only the wallpaper remain. You can now launch any app and it'll open in a freeform window. Braden has told us that there might be a more reliable way to launch Taskbar. After you clear your recent apps, you don't need to go back to the homescreen and open Taskbar then close it several times, hoping it'll make the launcher disappear in the background. Instead, just go back to your empty Recents screen and tap the Taskbar app drawer icon from there. It should launch its app list and then any app you choose in Freeform mode from the first go. I followed the steps to test it and at first, the apps were opening as usual, but I rebooted my Nexus 5X once more and it worked like expected. You can move the freeform windows around, tap and hold on any border to resize them, and switch between them as usual with the Recents key. 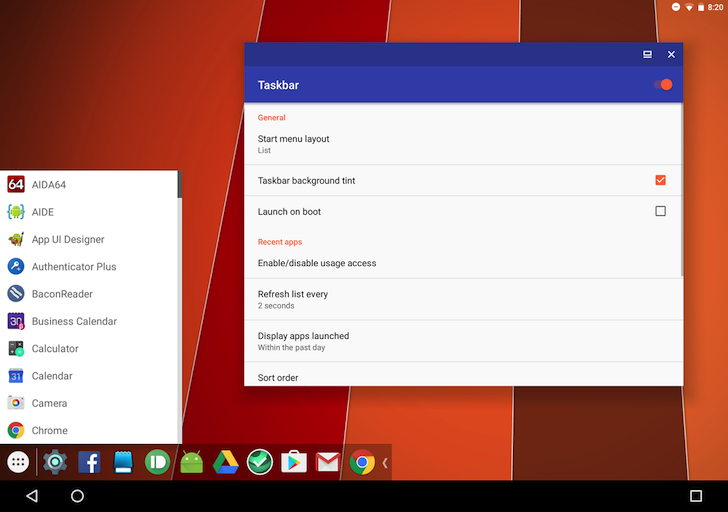 Taskbar is free so you can grab it now and test it out on your Android Nougat device. Freeform will work on phones and tablets, but obviously its benefits are limited on smaller screens.